Everyone, please go to this site instead...http://forums.shyguystoybox.net/ its really cool. You can also stay here just go both places k thanx. I am finally on here. and I have been begged to Join. I trust you shall be an active member since you're all ready a forum user unlike most of our members. Its so good to see you on the forum!! Finally too, you take your time. I will post every day!! Not a doubt, my new friend. I may be a bag, but not a douche bag. I can only be on for a little bit. I'll be on at like 7 tonight. 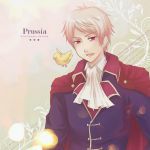 Anyway thanks for joining Prussia, encourage any of your friends to join too! I'll try to get the ones from Waiting for APH. Like Greece, Ivan, or PR. But I would ask Mexico before PR. Or I'll ask Chita and Denny. Maybe England too, Or Tiski or Moscow. Egypt is going to get banned, she is really annoying. And if Greece joins, then Turkey cant. everytime they are on together its another fricken war. And Mexico is really cool so far. I dont know her well though. She is annoying, but I like Moscow, Chita, and Tiski. england Turkey adn I dont really get along. and Turkey is just rude. I have Kalin's MSN, so I can talk to her. France and Japan have switched? Ya and the Tofu Union is DOMINATING!!! Why isn't it just russia?